Signed picture of Frode Grodas the Chelsea footballer. Home » Signed picture of Frode Grodas the Chelsea footballer. Frode Grodas. This is a terrific A4 colour full length picture of Frode Grodas the former Chelsea footballer. The RARE picture is taken from a BIG SHOTS football album of the time and shows Grodas in full length action. Grodas spent six years abroad, in England, Germany and Spain. He won the English FA Cup in 1997 with Chelsea, keeping a clean sheet in a 2–0 win over Middlesbrough in the final. The picture has been hand signed using a fine black sharpie. 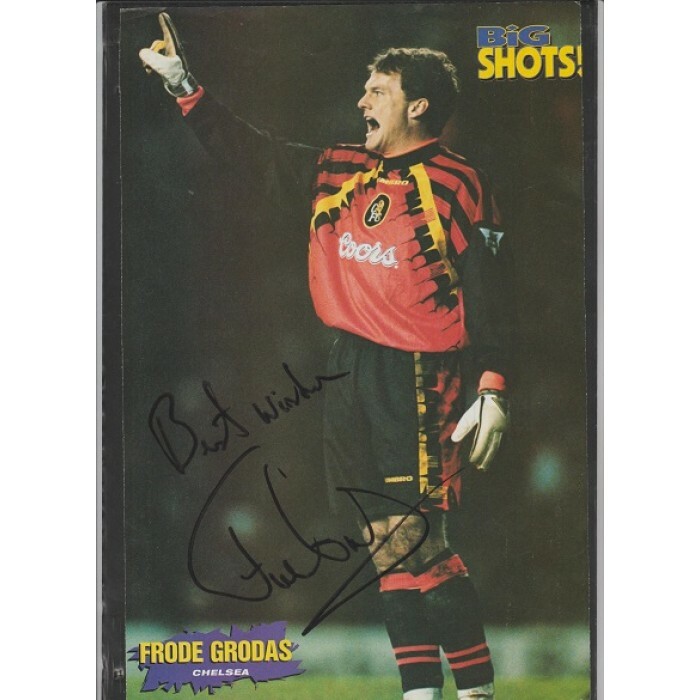 Frode Grodas played only 21 league games for the blues between 1996 and 1998 making this a very hard to obtain item. Grodas won 50 caps for Norway.